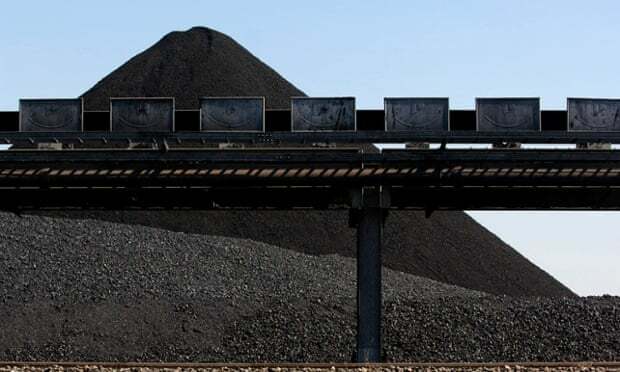 Leading economists and City analysts are baffled by plans from India’s Adani Group to build the A$16.5bn (£8.4bn, $13.2bn) Carmichael mine and Abbot Point port expansion – just as coal prices have collapsed. If the Carmichael project fails to convince investors, it could jeopardise plans for at least eight other mega mines in the coal-rich Galilee basin. The Queensland government has been an enthusiastic supporter of mining the Galilee basin: it has poured A$2bn (£1bn) of public money into funding the expansion of the port, according to the Australia Institute. As China’s demand for coal slows, the coal boom of the last decade has turned to ash. The price of Australian coal fell to $56 a tonne earlier this month [April] – less than half its level four years ago. Since 2010, two coal-fired power plants have been shelved or cancelled for every one completed, according to a CoalSwarm/Sierra Club survey. The amount of worldwide coal-fired generating capacity in the planning pipeline has dropped by 23%, from 1,401GW in 2012 to 1,080GW in 2014. Some analysts argue that coal has entered “structural decline”, amid signs that China’s economic growth rate is no longer in lockstep with fossil fuel consumption. Last year, China’s coal production and consumption fell for the first time in 14 years, as the economy slowed and the authorities came under pressure to clean up cities choking on pollution. Coal imports fell by 10.9% in 2014, a much steeper fall than the decline in factory output – a sign that the link between Chinese growth and coal may have been broken. Australia’s other big export market may not take up the slack. India’s power and coal minister, Piyush Goyal , has said his country may stop importing power-generating thermal coal within three years as it expands domestic production. Bluechip financial institutions, such as Morningstar and Morgan Stanley, have downgraded their forecasts for coal prices. Australia’s largest investment bank, Macquarie, concluded in 2013 that any project in the Galilee basin would need “deep pocket” backers willing to ignore conventional economics. At least 11 international banks have distanced themselves from lending to Galilee miners. The mining industry dismisses the idea that coal is in terminal decline. But it has come under fire for its optimistic sums. Last month [ 27 April] an expert witness for Adani Mining Pty Ltd, part of Adani Group, an Indian multinational conglomerate, told a Queensland court that the Carmichael mine would generate 1,464 jobs and up to A$4.8bn in royalties, a far cry from the 10,000 jobs and A$22bn the company has touted in its publicity campaigns. Gina Rinehart, the richest billionaire in Australia, is the face of the “lucky country’s” mining boom. She turned an inheritance from her father into a fortune worth $12.3bn and is irritated by descriptions of her as an heiress. 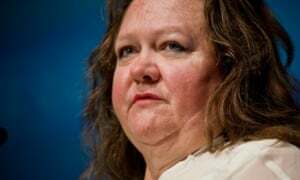 In 2012 Rinehart was declared by Forbes to be the richest woman in the world, although falling commodity prices have cut her wealth by one-third, pushing her off the top spot. The publicity-shy mining executive, who once criticised Australians for not working hard enough, is a fervent believer in small government. In 2012 she proposed turning a vast swathe of Australia – northern Queensland, northern Western Australia and the Northern Territory – into a low-tax, lightly-regulated “special economic zone” – a vision she shared in a poem inscribed on a plaque on a 30-ton boulder in Perth. Falling squarely in this special zone is the Alpha mine and railway that Rinehart’s Hancock Coal hopes to develop with Indian conglomerate GVK. The Alpha mine, expected to produce 60m tonnes of CO2 a year – as much as 11% of Australia’s total emissions – is currently being challenged in court. Rinehart has previously dismissed climate change: “I have never met a geologist or leading scientist who believes adding more carbon dioxide to the atmosphere will have any significant effect on climate change.” But rather than hobnobbing with scientists, she is better known for funding speaking tours for opponents of climate science, such as the former Ukip deputy leader (Lord) Christopher Monckton. Clive Palmer, the colourful mining tycoon turned politician, is best known to the wider world for his dream of putting a lifesize replica of the Titanic on the high seas and building the world’s biggest dinosaur park. For environmentalists his mining activities are no less outlandish. Waratah Coal, a subsidiary of his Mineralogy empire, plans to build the Galilee mine, with the aim of extracting 40m tonnes of coal a year by 2020. Palmer, 61, gave up the chairmanship of Mineralogy, but not ownership rights, after narrowly winning a seat in the Australian parliament in 2013. But the links remain close. His Palmer United party (PUP) received nearly A$29m in donations, the vast majority of which came from companies he owns. In the first year of his life as an MP, Palmer attended just 7% of all possible votes and was most active on laws to repeal carbon and mining taxes. He has always been a robust defender of his business interests. 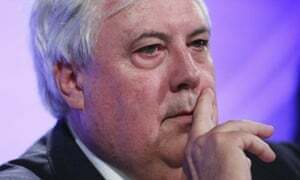 In 2012 Palmer accused the US government of funding opposition to the Galilee basin coal mines. He alleged Greenpeace was funded by the CIA as part of a plan to damage the Australian mining industry, although was later forced to tone down his remarks after a rebuke from Australia’s foreign minister. Neither does Palmer seem to worry about offending his biggest customer: a tirade about Chinese “mongrels” in 2014 sparked a rebuke from Beijing. Palmer later said he had been referring to a company he was in dispute with and not the Chinese people. 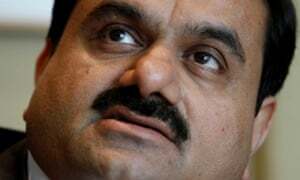 Gautam Adani is the Indian tycoon behind the biggest proposed mine in the Galilee basin, the A$16.5bn Carmichael mine. But he is a much more anonymous figure than his Australian peers. Adani made his fortune in his home state of Gujarat by building a port that became the world’s largest coal unloading facility. He founded Adani Enterprises in 1988, turning it from a small commodity trader into a vast conglomerate with interests in mining, cargo and power generation. Although Adani Enterprises is listed on the BSE (formerly known as the Bombay Stock Exchange), ultimate ownership lies in the tax haven of Mauritius, where the tax rate is just 3%. Between 2008-13 Adani’s revenues boomed by 77%, as the growth of India’s middle class helped the company defy global recession. But Adani’s fortunes have also been boosted by his friendship with India’s prime minister Narendra Modi. The relationship dates back to 2002 when Modi – then chief minister of Gujarat – was accused of turning a blind eye to violent Hindu mobs that killed more than 1,000 people, mostly Muslims. “It was Adani along with other Gujarati businessman, who stood up for Modi and reiterated that Gujarat would remain a preferred destination for business and investment,” journalist Mosiqi Acharya wrote in a profile for the The Age. The friendship continues to pay off. When Modi won the premiership last year, the share price of Adani Enterprises went through the roof, almost doubling Adani’s personal fortune to $6.5bn.